The Country Cobbler takes pride in the repairs performed on shoes, boots (including western, riding, casual and dress boots), dance shoes, handbags, belts, garments, dance taps, stretching and a variety of hand and machine sewing and miscellaneous work. All shoe repair is done on the premises. Quality shoe repair has been done on sight since June 1981. 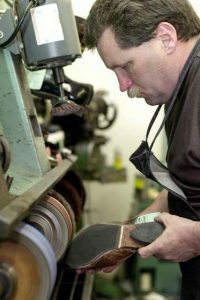 We use a variety of high quality materials including Vibram and Birkenstock (we are one of their authorized repair stores). Our goal is to meet or exceed our customers expectations.